A painting of Vanity Fair editor Graydon Carter playing a pancake fiddle. 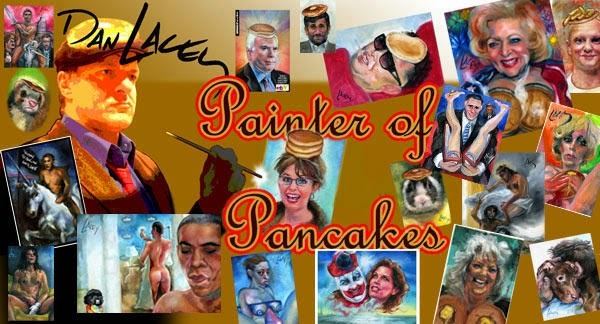 Continuining the series, a painting of Obama artist Shepard Fairey with a drippy pancake on top of his head. Thanks to The Economist magazine for the post. An oil and acrylic Michael Jackson art painting, utilizing a very colorful 'This Is It' multi-color scheme. A few of my previous Michael Jackson paintings. By request of Poe News, a painting of the dead deer dressed in a clown suit and wig and deposited on a front porch in Iowa. I'll normally touch-up a painting after selling it, and sometimes this touch-up becomes pretty extensive. I know it isn't necessary, but I feel better for having delivered a better product. Unfortunately I can't always find the time to scan the revised painting, so many times only the purchaser knows what the final, completed painting actually looks like. This morning I noticed that someone posted my original Mancow unicorn painting to a site called Expressobeans. Luckily I saved a scanned image of the revised version, which for a larger painting normally takes two scans which I then stitch together in Photoshop to create the online image. An oil and acrylic portrait of Obama 'Hope' poster artist Shepard Fairey with a buckwheat pancake on his head. Thanks to Bob at Hurt You Bad for the post of my previous Shepard Fairey painting. Russian iceskating bear kills cirus director- PoeNews. British comedian Dave Gorman has tweeted my Obama Unicorn paintings, so I'm returning the tweet with a pancake painting. An oil portrait of Barack Obama as a Juggalo. A painting of Obama poster artist Shepard Fairey with a pancake on top of his head. The 'Unusual Paintings of Obama Naked With Unicorns' post on Wild Ammo has hit 1000 tweets. A painting of Rush Limbaugh with a deflated football on top of his head. The high-bidder currently is a virgin Ebay bidder named Tinsley. Presenting the painting at the Joke Joint. The winning bidder of my 'Nobel Prize Obama' painting is graciously allowing me to make a few revisions to the finished piece; I'll post a revised image in a few days. A painting of MJ bathed in a blue light. Michael Jackson looking dapper in a suit. My Ebay ToGo widget at the top of this page has the flu. Hopefully it will come around soon. I should have a new painting for Gawker finished by Monday morning. A painting of Obama and his Nobel Peace Prize. A painting of Obama and Penelope the Unicorn waterboarding radio host Mancow. A portrait of Sarah Palin for Halloween. A portrait of Hillary Clinton for Halloween.